The unique ground floor is well thought out with a sizeable kitchen come dining room featuring impressive bi-fold doors that lead out on to the garden whilst the separate living room offers french doors to the rear garden. A useful study, utility room and cloakroom complete the ground floor. The first floor is equally as impressive, comprised of four double bedrooms and ensuites to the master and second bedroom. Bedrooms 2, 3 & 4 all feature built in wardrobes and are served by the contemporary, family bathroom. 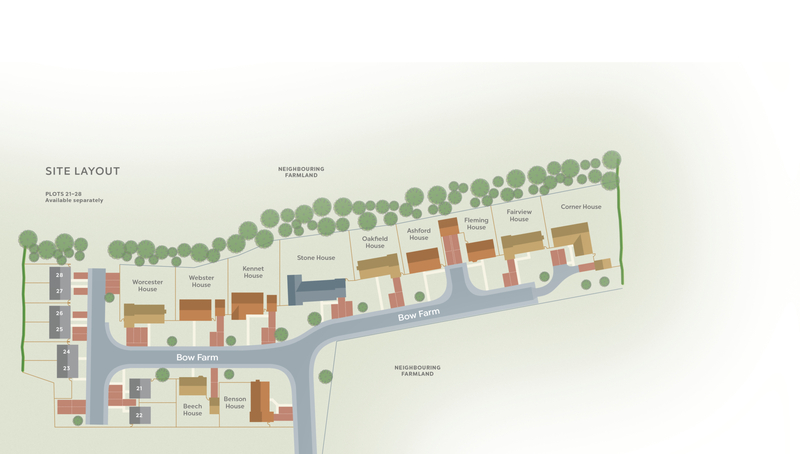 To register your interest in Kennet House, Plot 31 and/or to arrange a viewing, click the button below and fill out the form. 4180mm x 3935mm 13'9" x 12'11"
1915mm x 1890mm 6'3" x 6'2"
4330mm x 3225mm 14'2" x 10'7"
1945mm x 1915mm 6'5" x 6'3"
4005mm x 3060mm 13'2" x 10'0"
2150mm x 2000mm 7'1" x 6'7"
4375mm x 2635mm 14'4" x 8'8"
3075mm x 2370mm 10'1" x 7'9"
Kennet House, Plot 31 is part of the Bow Farm Phase Two development. For more information click the button below.